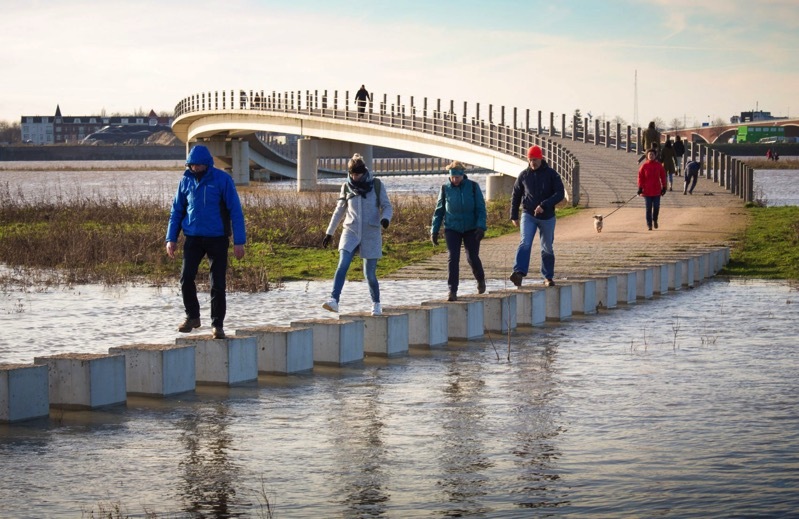 Stepping Stones Allow Dutch Bridge to Remain Accessible During a Flood « Adafruit Industries – Makers, hackers, artists, designers and engineers! Innovative way to incorporate rising water levels into bridge design from Next Architects and H+N+S Landscape Architects. Rather than lifting the surface of the bridge above the floodplain, the designers decided to embrace the water. So when the water level rises, sections of the pathway on either side of the bridge become fully submerged. When this happens, the concrete blocks on the surface of the bridge – which ordinarily function as seats – become the only way of traversing the water. “All designs by Next Architects start from the unique characteristics of a place,” explained Michel Schreinemachers, a partner at the Amsterdam-based firm. Not such a great design if you need a wheelchair to get around.